Can't spell Stellaris without stellar! Paradox has made some complicated games. I mean, have you tried Crusader Kings II? Even after playing its tutorial, I had no idea what was happening most of the time. Like many games, I had to resort to player-made tutorials in order to comprehend just about anything. 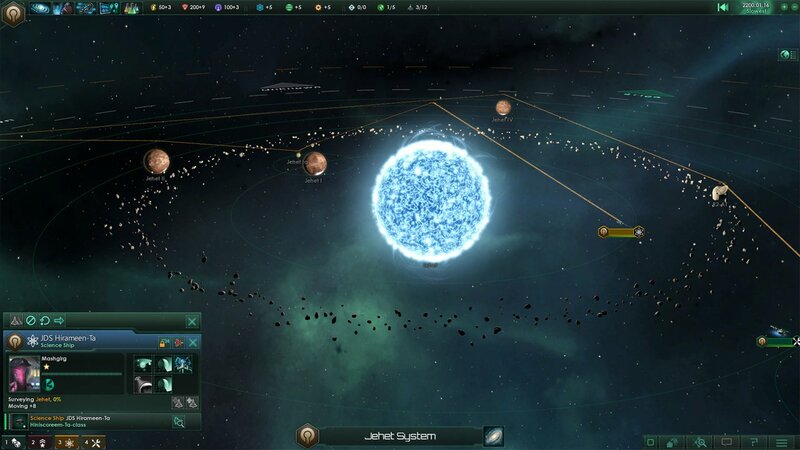 With Stellaris, Paradox has shown all that it has learned, both in the way to introduce mechanics and how to make a damn good strategy game. Man, where do I even begin? 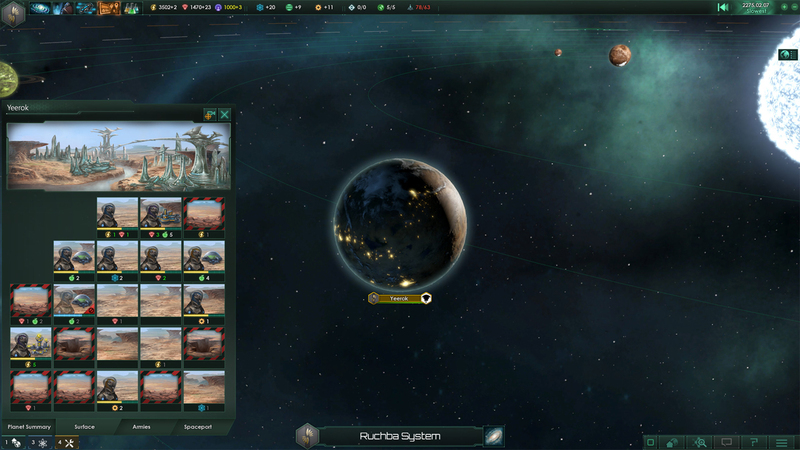 Stellaris is known as a "4X" strategy game, which is short for explore, expand, exploit, and exterminate. See how clever that is, with the Xs? Anyway, it's essentially a way of saying that the player has a host of options available to them as they play. In general, expect to grow borders, make deals with other factions, and fight in some wars. This is all very true in Stellaris. Many of the 4X games have gotten a notorious reputation for being incredibly hard to get into because of their insane depth of mechanics. Whereas Civilization is rather approachable for new players, games like Crusader Kings II generally require something like watching hours of player-made tutorial videos before really feeling comfortable. As for Stellaris, the complexity falls somewhere in between Civilization and Crusader Kings. Luckily, it has a brilliant tutorial approach that is sure to help newbies and veterans alike get acclimated to the various systems at play. Rather than have a dedicated tutorial option, where players go through a stilted and guided version of the game, Paradox has integrated the tutorial into the main game. When beginning a new game, there's the option of selecting a full tutorial, tips only, or no tutorial at all. With the tutorial activated, tooltips and descriptors will pop up as the player clicks on just about anything. If you've ever been in the "wait, what's this thing do again?" situation, you will certainly appreciate this method of tutorializing. And really, it works great. With so many mechanics taking place at once it is easy to forget one or two after a while. Once players feel comfortable and no longer need the tips, clicking the "Don't show again" button will hide it for the rest of the game. The end results is accessibility. I have a decent amount of 4X background, but I'm confident that the game is approachable by anyone willing to take the time to learn the systems. There's also in-game access to the Stellaris wiki for any questions players might have. Despite this, I still found myself with unanswered questions from time to time. The wiki isn't as detailed as I had hoped, leaving me guessing at specific questions I had. 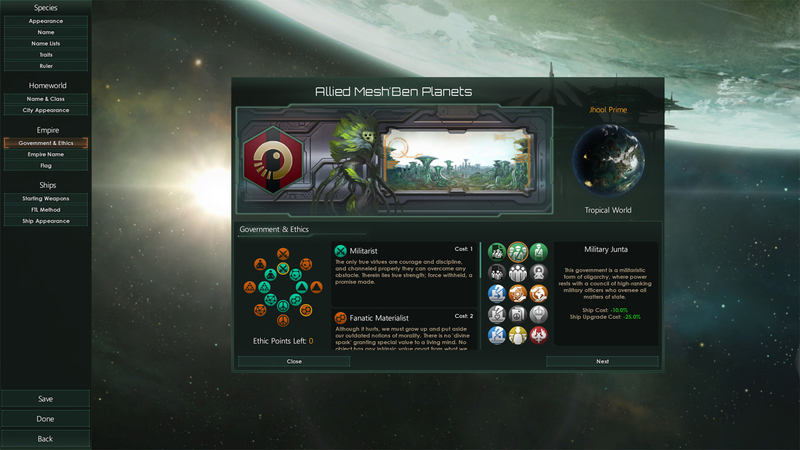 Players can choose from many of the preexisting races to play as, but doing so would be skipping one of the best part of Stellaris: customizing a race to perfection! Being able to choose traits, weapon type, aesthetic, and plenty of other attributes goes a long way to feeling a connection with the empire. It can also be interesting to completely randomize everything and go with the flow. With the empire chosen, it's time to set up the game. Map sizes range from Tiny (150 stars) to Huge (1,000) stars. The galaxy shape can be elliptical, spiraled, or ringed, though some options will not be available with very few stars. From there, the number of AI empires can be chosen, as well as how many get a "head start," which prevents everyone from hitting the same technology benchmarks around the same time period. It makes the game a lot more interesting, since spawning next to an advanced empire can be very dangerous or very beneficial, depending on your empire's approach and negotiation tactics. Another important option when creating a new game is "Allowed FTL Method." Faster Than Light travel methods have a huge impact on playstyle, and it's possible to limit the options available to empires in a game. There are three options available: warp travel, wormhole travel, and hyperspace travel. Warp travel is recommended for beginners as it is the most straightforward. It's the slowest, but for the most part, it consists of clicking where you want to go and going there. Worhmole is more advanced, and requires setting up Wormhole Stations for quick travel between two points. Hyperspace is quicker than warping, but forces players to follow linear paths between stars. In a game about exploring and expanding, it's easy to understand how important travel methods are. Wormhole travel is very infrastructure-based, but can allow for some incredible freedom for you and your allies. The early game changes dramatically based on the travel method chosen, though I would definitely agree with choosing warp for new players, since wormholes can take some time to figure out and use effectively. Okay, so, the game. 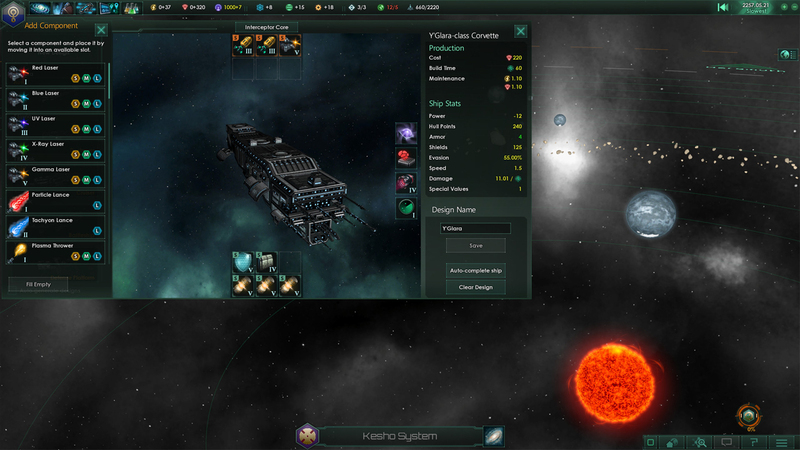 Players start with a homeworld, spaceport, science ship, and construction ship. Science ships are the ones to send out and explore new star systems. They can survey planets to see what, if any, resources they may contain. The construction ships can then build stations around the planets to harvest that resource. There is plenty more they can do, but if I went into each minute mechanic in Stellaris this would be more along the lines of a dissertation than a review. The home planet is way more than just an idle "base." A planet's surface is visualized as tiles, each with resources attached to it. To harvest those resources, a Pop, or person, must occupy it. The Pop slowly grows over time, allowing players to occupy more resource tiles, but also increases the food consumption on the planet. Trust me, a starving planet is not a happy planet. Buildings can be built and eventually upgraded on tiles to increase or change the resource harvested. There are lots of resources to keep track of in an empire. The big three are Energy, Minerals, and Influence. Just about everything built consumes Energy as long as it exists. Ships, stations, buildings -- you name it and it is costing Energy; think of it like electricity. Minerals are like money, and are spent on most everything. Influence is a bit more abstract, as it represents "political clout." It's a resource that increases slowly at best, so any decisions that use Influence, like enacting new political edicts, are not ones to make lightly. Research! Did I mention research yet? There are three research categories: Physics, Society, and Engineering. Each has its own harvestable resource, which can be then spent on new technologies like weapons, buildings, and ideologies. When one research concludes, players are presented three new opportunities that are somewhat randomized. It doesn't follow the traditional "tech tree" pattern, and instead forces players to choose from the most appropriate of the available options. The early-game is very small-scale. It takes time to expand, which helps ease players into everything. The focus is to build up resources, explore the neighboring stars, and start to make contact with foreign empires. As it marches on, there are more and more things to keep track of, and Stellaris starts looking a lot more like the grand strategy genre it belongs to. Working out deals with the other empires is a very important part of the mid-game, since it essentially sets up the alliances and federations that define the late-game. The negotiations screen is a bit more simplistic compared to many other games in the genre. Just about all of the basic elements of negotiation are present though, like mineral swapping, border access, and research agreements. It's straightforward as to which deals will work and which won't, since there's a "Trade Acceptance" score that must be above one to have a chance at succeeding. The late-game is all politics. At this point, many alliances will form and wars will be declared. Empires will begin having many smaller (but still big) armies in various places instead of one deathball-esque blob since danger is way more omnipresent than before. Resource management is absolutely crucial, and it's at this point that knowing things like having armies orbiting a planet uses up less resources than if they were just idle in space becomes paramount. Luckily, the game can be paused at any point to take a moment and think things over, and on the flip side, it's possible to increase the speed to rush towards a certain moment in time. Generally speaking, Stellaris moves at a good pace. It can also be a great game to alt-tab and leave running, listening for the notification noises and jumping back in when necessary. Just be aware that there are plenty of moments that demand full attention. On top of all this, random events will take place to help spice things up. Players will come across artifacts on ancient planets or even budding civilizations. 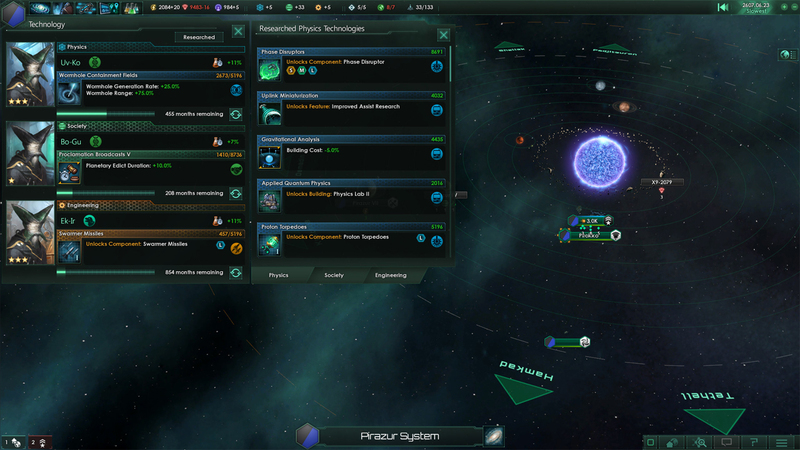 There's so much to discover in Stellaris and no two games are remotely alike, and you can bet that players out there will be spending thousands of hours roaming various galaxies. In this case, it will certainly be time well spent. I can't even begin to imagine the intricate multiplayer conflicts that will go down when dozens of players get together to compete in space. Building up an empire is so incredibly satisfying. It is wonderful to zoom out of the map and see how far your borders have come, or to watch your alliance work together to destroy some alien scum. It's also exciting to explore the various other smaller mechanics that make the game so unique. Why not be an empire that promotes slavery? How about making a planet mostly full of robots? The possibilities are endless, especially when you throw mods into the mix. 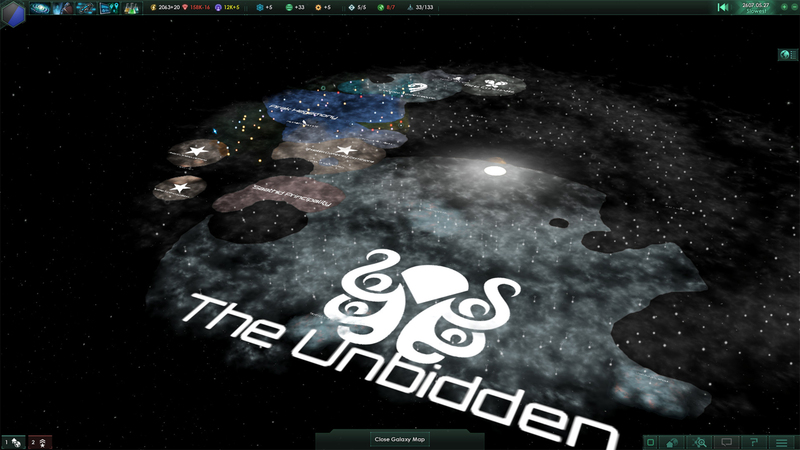 Paradox has a longstanding history of being mod friendly, and Stellaris is no different. 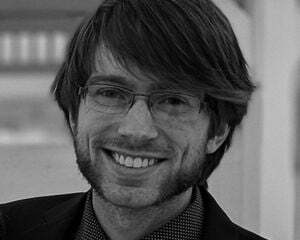 The studio has talked time and time again about how moddable the game is. Want to increase the galaxy size to 5,000 stars? Go ahead! Want to create your own race, complete with a unique picture? Sure! I absolutely cannot wait for someone to make a Dune or Star Wars mod, which I'm sure will be available in no time. There are plenty of mechanics I haven't even touched on, but hopefully by now you understand what to expect. Paradox has done a wonderful job making such a complex game approachable. It goes a long way towards making the experience enjoyable, since the player never feels at odds with the extensive mechanics. It's amazing to explore not only the galaxy at large, but also the breadth of options available. Don't be surprised if you want to start a new galaxy before conquering your first. This is a game for anyone who has already enjoyed the grand strategy genre or anyone who has always wanted to. There is a strong sense of accomplishment from starting an empire and guiding it along the path you choose, even if it eventually ends in failure. Stellaris is easy to comprehend and exciting to execute, which is a perfect combination for a genre notoriously difficult to break into.